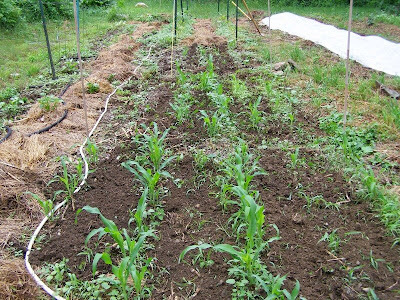 The 2nd, 3rd, and 4th plantings of corn. 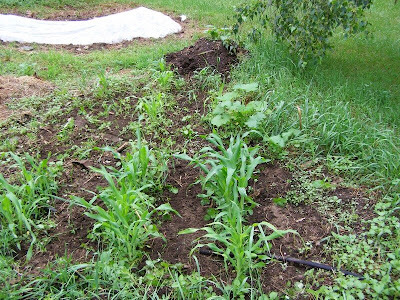 2&4 is Silver Queen, I believe 3 is Peaches & Cream (I have what's planted where written down in a log in my truck). 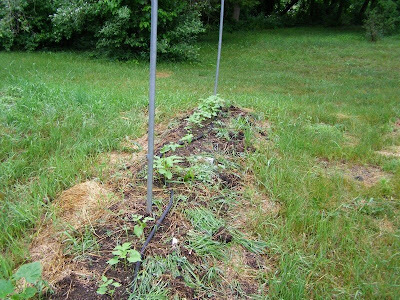 Also, to the left you can see some more straw potatoes coming up. I would like to find some more mulch for them, but I'm not spending money on any! 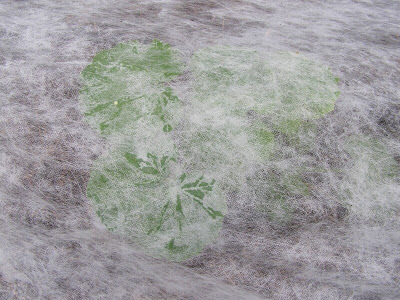 Under the fabric the summer squash is doing well. The tomatoes in rows. 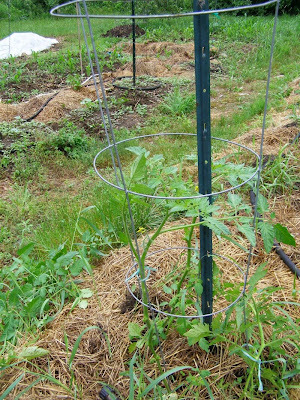 Added another string this week, and tied that in places to help support the plants better. There's some lettuce I planted in between them that I need to thin. We'll see how that does... One of the cage tomatoes. These I've pruned. Trying to prune some of these this year to see how they do. Next year I really, really need to use a board when planting to make sure I get consistent seed depth. 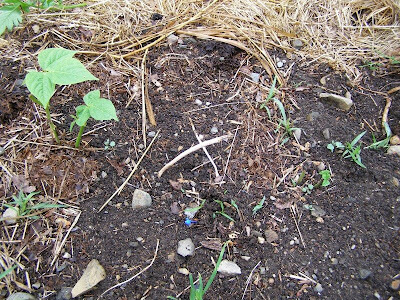 There are three bean plants in this picture -- the two at the left, plus one just sprouting on the right. That's from a difference in depth of planting. This shows the inconsistent age down the row. 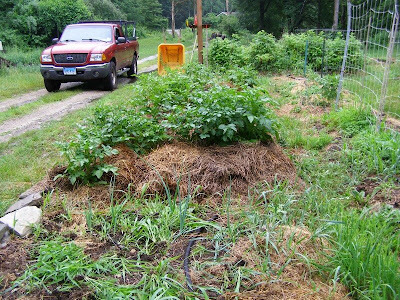 And a volunteer cucumber in the lower left corner. 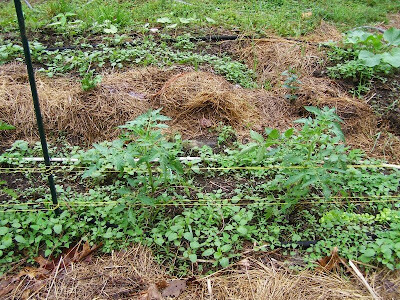 Probably can't see them well on the blog-sized picture, but my onions are foreground with taters in the back. I've never grown onions before, but the few that lived seem to be doing OK.
Did battle with potato beetles some more...a bunch got finger squished. 1st planting of corn -- "Early Glow." Towards the rear is the ones I tried starting in peat pots. What I direct seeded later is doing much better. I plant corn very thickly compared to normal recommendations. I just find it does better IMHO -- they seem to thrive off competeting with each other. Just need to have plenty of nutrients available.